That's the Way He Does It! It's one of the sadder facts of my life that I've never met Chris Reilly. Sad because not only are the folks who work in and around comics typically really good people, but also because he's an incredibly funny writer. Hey, someone who's capable of relating the psychotic adventures of a character with little or no real redeeming qualities in a book that's not only suffused with a heap of laugh-out-loud shtick, but which also provides some little insight into the human condition itself can't be all bad. Not entirely good -- or sane -- perhaps, but certainly not all bad. Oh, yeah, and this latest installment of his Punch and Judy series reveals some deep, dark secrets about Santa and his elves that are just so wrong he's gotta be right. Now that's someone I want to know more about. Bill Baker: For those who might not be familiar with it, how would you describe the original incarnation of Punch and Judy? Chris Reilly: It's a pretty faithful interpretation of a story that's never been told exactly the same way twice. Darron [Laessig, the first book's artist] and I read dozens of versions of the puppet show, pulled out the parts that we thought worked best, or were essential, and we cobbled a story out of it. We had to leave a lot of material out because we couldn't do a two hundred page book. One bit that we left out was something I used in A Grand Guignol: the fact that Punch had a true love, a mistress named Polly. The first book [The Comical Tragedy of Punch and Judy] was a Classics Illustrated version of a book that never existed. It is dark, funny and ... darkly funny? BB: What was your first exposure to Punch and Judy, how'd you get interested in this type of entertainment, and what about it appeals to you? CR: I knew I'd seen it as a child, but I couldn't remember where. I became more interested in it when I was a teenager and I saw the movie Time Bandits, when John Styles treats Napoleon to a Punch & Judy show. When Napoleon said "I like it when the little people hit each other" (I don't remember the exact line) it dawned on me that it was a really sick story. I'm a real slow learner; it took me fifteen years to realize that a guy who murders everyone he knows was not your typical children's story. I actually started looking for a comic book adaptation of the book back in 1981. I was convinced that someone had to have done one. Life was tough before Google. I guess the reason I was attracted to the story would be for the same reasons I was attracted to Superhero books; power fantasies brought to life (sort of). I became a teenager in Reagan's 80's and that was a weird time. We realized that the enemy wasn't just lurking behind an iron curtain, but was swearing on a bible at 1600 Pennsylvania Avenue. I remember in the eighth grade we watched the president's inauguration, and the students in Iran, on cue released the hostages. This was something that disturbed me to the core. I was twelve and I realized that at this point in history, Watergate was for tourists, and things were only going to get worse. So, like most early teens, I entered the exclusive "We will be nuked before turning 30, so we don't have to worry about ever being old" club. I did this as a typically angry kid. Most people my age were angry at the world. When I rediscovered Punch, I rediscovered a guy that solved all of his problems by beating them to death with a club. That was easier than the real world, and it's also funny. Violence where no real person or thing is hurt can be funny and exciting. I drew a comic strip for years called Rogue Satellite Comics which featured a character called Moon, who was basically Punch. I didn't know about the public domain, and thought that someone must have owned Punch. I drew it for years and changed the date each year. I changed the date so it looked new, and people wouldn't think that I'd wasted three years and still not sold this concept to a publisher. The RSC that you saw is dated 1993, but was more likely drawn in 1989. BB: What lead to your decision to adapt Punch and Judy to comics, and how difficult was that process? CR: I really hate to admit this, but part of it was cowardice. I was looking at work that I loved at the time, like Jim Woodring's, and I knew that this brilliant, introspective, abstract work sold as well as snow shovels in Ecuador. I also knew that retarded violence sold really well, so I did the book where the guy kills everyone with a stick. I don't think it was retarded but I knew it would be an easier sell than personal meditations on life and the world around me. Actually, said meditations, probably lead to the revelations that resulted in the book. Don't take that the wrong way, I wasn't writing down to an intended audience, I just thought that out of all the stories I wanted to tell, this one might find a decent audience. BB: How did Darron Laessig get involved and what about his work made him the right artist for this particular project? CR: Darron was there from day one. When the words "I want to do a Punch and Judy comic" were spoken, it was in a conversation between me and Darron. We were trying to do an Image style super hero book called Meridian which we finished, but it was never published. There was an add for it in Oz Squad # 4, and it was going to be published by Patchwork Press, which I was one of the cofounders of. Eventually reality set in, and Darron and I both realized that though we both liked super hero books, we didn't really want to be creating them. I was a cartoonist trying to be a writer, and Darron was an artist trying to be a draughtsman. Darron's results were spectacular, and mine were humbling at best. We started talking about what we should do and it lead to Punch and Judy. I never looked for an artist for Punch; Darron was there from the beginning. I created it with the artist. BB: How is a typical Punch and Judy comic created? Do you two work closely together on the plots during the initial stages, or do you handle all the plotting and scripting chores, and Darron just concentrates on the art? CR: For the first book we talked everything through, and then I wrote it full script and Darron drew it. If Darron thought something should be added it was added. "Rootle-te-tootle-te-toot" was Darron's, I just added the classic Punch tag-line "That's the way to do it." The second book never had a moment you'd call typical. BB: What kind of scripts do you provide Darron with? Are they fairly loose, what's typically called "Marvel-style" scripts, or are they tighter, more detailed in nature? CR: The first book I wrote a panel to panel breakdown, which I guess is "DC" style. I majored in film and taught it for a while, so angles, pacing, lighting ... it's all very important to me. A lot of the time Darron would make major changes, most for the better, so that would change on the second book. I started writing the second book in prose, and I was just going to let Darron go to town. We both loved Tim Burton, F.W. Murnau and Ed Wood, so we were on the exact same page. Darron drew pages six through nine with no script. After twelve pages, other commitments made it impossible for Darron to finish the book, and I thought that it was all over. No Darron equaled no book. I lucked out and met Argentinean artist Jorge Santillan, loved his work, and we did a strip together called Hector Mortem's Castlefreak. Hector was a character that was really important to A Grand Guignol; actually, he was probably just as important as Punch himself. Punch, as a book was going to die, and I was working on a strip that featured a supporting character from the book. I decided to ask if Jorge would finish the 48 pages needed to complete A Grand Guignol, which at the time was called "Third Elf." I asked Darron what he thought, and he gave his blessings. Jorge and I are on the same page as much as I am with Darron, but Jorge prefers full script, so most of the book was rewritten, full script for him. BB: You've made some very interesting choices regarding speech patterns for the characters, particularly with Punch. What lead to this state of affairs ... and how difficult is dialogue, and capturing the voice of the characters, for you? 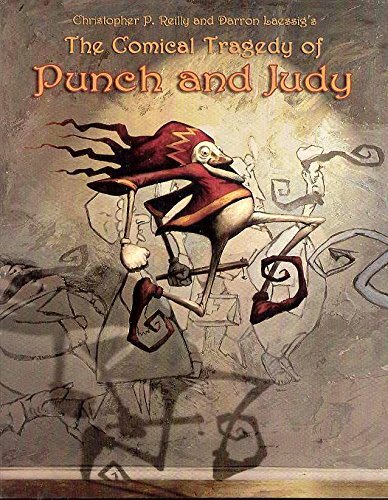 CR: I thought that if Punch was going to stand out as a unique book, that it needed a unique voice (literally) I wanted the reader to be able to close their eyes and have a line read to them in a "name that tune" fashion, and be able to say "Oh, that's the Doctor" or "Man, that must be a crocodile demon; only crocodile demons talk like that." Dialogue is really important to me; I'm a big Elmore Leonard fan, because he has insanely inventive dialogue. The first time that I realized that dialogue should be as creative as the story itself was when I read Get Shorty, back in 1990. A great deal of my want to create original, playful dialogue comes from reading Krazy Kat all my life. George Herriman created a patois of speech based on such diverse elements as American Indian, African-American, Yiddish, Spanish, Shakespearean English and Latin. He also added his own unique spelling (which actually really annoyed me). Characters also quoted poetic dialogue from the classics - often bent to amplify the story line. He threw all these elements into a blender, but his words were never random, and always consistent. I got a lot out of Krazy Kat. I think my structure is inspired by Woody Allen (stories are told within stories, but everything comes together in the end), my dialogue is fueled by the standard that Elmore Leonard set, and the formula for creating kooky speech patterns which Herriman was kind enough to share with the world. It is really hard to capture the dialogue at first, especially Punch's because his nonsensical speech patterns are anything but random... After a while it's like riding a bike. It's probably the same for any writer. I'm sure Joss Whedon knew what he thought Buffy should talk like in the first season, but by the second season's premier, I would wager that he knew Buffy, and she spoke for herself. BB: As you noted above, the one major difference between the two Punch books to date is that, in the first book, you seemed to stay within the general outline of a traditional Punch and Judy play, while your sophomore effort moved in a different direction. Which brings up the questions of how deliberate was that choice, and the reasons why you deviated from that tried and true storytelling formula? CR: Was it conscious? Absolutely. 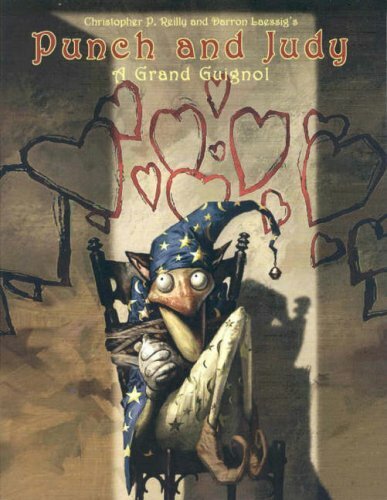 The first book was supposed to feel as though it could actually be done in the confines of a puppet-opera. If you look at that book, most of the character's expressions are fixed, as if literally carved in wood. The only thing that makes Punch look as though his expression changes is the shadow and light under his spacious honker. This is right out of the Puppet show. That's how Punch Professors all over the world change the puppets expression; with tilting... moving him so as to make the lighting and shadows make it look as though he were smiling, or angry. It had a lot of limitations, one of which being that there was an audience that knew this character all of their lives, and having him do something out of the confines of his world would have been a slap in the face to them, and disrespectful to the character and the many men who created him. I didn't want to be the guy who had adults show up in Peanuts. In the second book the idea was that this is the same Mr. Punch, but let's take him out of the puppet box, lest we bore the reader to death. The reader had their traditional retelling of the puppet-opera, and now they'd get something wholly new, without betraying what came before. The first story did happen, but we add what happened before, and what followed. I wanted this to be like a Hong Kong Kung Fu movie. I wanted it to be epic, have action, drama, comedy -- be one part fairy tale, two parts western, a love story, feature the baddest bad guy ever, and an unlikely hero; a little bit of everything. The first one was Classic's illustrated puppet-opera, this one's a Hong Kong Kung Fu movie. BB: Now, is this all fun and games, or perhaps even a kind of therapy on paper for you, or are you trying to do more than just entertain with these tales? In other words, is there some larger, perhaps more sinister purpose to these madcap and macabre hijinks, or is it all just intended as good, clean fun? CR: Since this is my only voice in print, I do squeeze in a more than a few personal agendas, and try to reflect what's happening in my life. Santa's reference to a team of "Elf Inspectors" being a very obvious one, and many more which are a bit more subtle. My main agenda is this; I invited you to a party, and asked you to pay a cover charge, and if it kills me I want you to feel like it was the best seven dollar cover that you have ever paid. I like to think that I let some air out of tires that are a bit too full of themselves. Punch is privilege, decadence and stupidity squared, so he's what's at the world's helm at the moment. It is certainly more madcap and macabre hijinks, but if that's all a reader walks away with then I've failed miserably. John Callahan tosses in a person in a wheelchair every few strips, because he's a quadriplegic; I toss in insanely uncertain, twisted relationships, to show that I'm emotionally crippled. Callahan's worse off; all I have to do is stop being a child; he can't grow new limbs. BB: What's next for you, and for Punch and company? CR: I'm trying to find a publisher for my next book with Jorge. It's called Girl World which I co wrote with Steve Ahlquist (Oz Squad). It's like that Heinlein book Rocket Ship Galileo, except the kids don't fight Nazis, they fight girls ... sort of. Girl World is Planet of the Apes but instead of apes it's girls. Basically; Three eleven year old boys in homemade space suits build a rocket-ship in their back yard. No one is more surprised than they are when the spaceship works and whisks them half a galaxy away, to crash-land them on Girl World. Girl World is a planet entirely inhabited by girls, all permanently aged 14-18, and they've never heard of boys or boy-stuff. It's a world of jewelry, pop-rock, fashion, ponies, dolls, chocolate, social issues and shopping. The tag line is "Can three boys survive a world gone ... Girl?" It sounds silly, but it has some serious undertones; lets face it, being an eleven year old boy and trying to figure out girls is not the simplest of tasks; eleven year old boys tend to be disgusting little messes to your average teenage girl. What fourteen year old girl wants to deal with her eleven year old brother, his friends and their Star Trek marathons and pet frogs? I am being kind of fussy about who publishes this one. I don't want to waste time on the four issues it takes to tell the story; it would work much better as a graphic novel. I like the idea of delivering the reader the whole story in one package, instead of calling a graphic novel a four issue mini series, to bilk the reader out of the TPB money. If Dan Vado calls me tomorrow and says "Let's do Girl World, but I want it to be a four issue mini series!" I'd probably say yes, because I'm afraid of Dan. 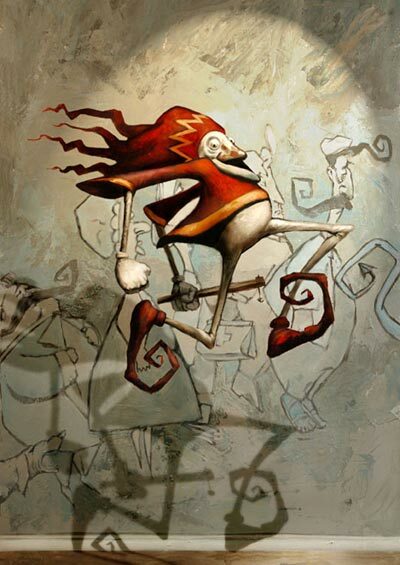 There's also Hector Mortem's Castlefreak, which I really need to submit to some publishers. The first issue is two pages from completion, and I don't have a publisher... I have been so busy with the new book, signings and conventions that I haven't submitted it to more than one publisher. Castlefreak is the sort of book that Jorge, Steve and I could do forever. 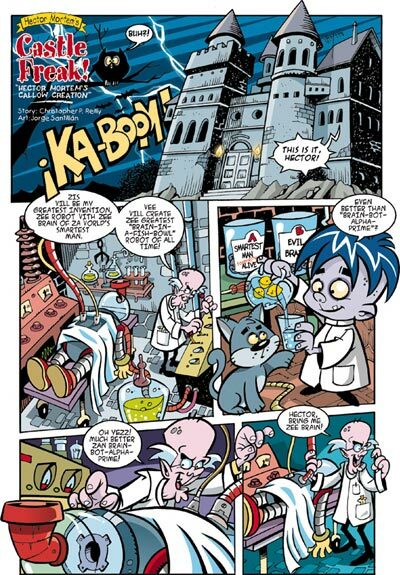 It's all about the sorts of things that we love; comedy, horror, mad science, haunted castles ... it's a fun book. I gave an ashcan to David Schwartz from Buena Vista, while at the SLG booth in San Diego, and he liked it so much that he's been trying to sell it as a TV show or film. That would be great, but at its core, it's a comic book. It would need a major re-haul to be a film or television show. Steve and I are always talking about re-launching Oz Squad. I am going to meet Carl Mitsch at a local tavern tomorrow, and I hope we'll be working on Punch and Yeti the next day. BB: What do you get from creating comics, as a writer? What about personally? CR: As a writer, I get to do what I love doing, which is telling stories. Comics are great, because it costs as much to make a Plan 9 as it does to do a Matrix. I tell the kind of stories that I'd want to read, and if anyone else likes them, I feel as though I'm a part of their lives. If you read my book, we hung out for however long it took you to read it, and that's magic. I never take being published for granted. If I didn't have a publisher I wouldn't have the knowledge that a few thousand people were reading my work, and a huge chunk of me lives through my work. Being a bit insecure, I tend to equate someone liking my work, as someone liking me, because the work is me in many ways. Seriously though, I hope that they all leave with more than they walked in with. CR: If anyone can't find the book, they can order it directly by whacking this link. Girl World is looking for a publisher. You, as a publisher can be the one to publish the next book by the creators of Punch and Judy.